Leave a copy of your itinerary & our contact numbers with family or friends so that you can be contacted in case of an emergency while you are not accessible on mobile. While checking out from hotels, kindly check the room carefully and ensure nothing was missed there. After leaving a hotel, forgotten items will never be retrieved. Never accept any gifts or packages from unknown parties. Don’t draw attention to yourself, avoid wearing flashy jewelry and don’t display large amounts of cash. Carry only enough cash to make it through the day and try to use ATM cards / credit cards . ATM counters are available at most of the Tourist places. There will be visiting time at Monuments, Museums & National Parks (most of the places it is 9 am to 5 pm). Normal check in checkout time at hotels are 1200 noon. – Early check in / Late checkout possible according to room availability. For guaranteed early check in, room to be reserved from Previous night. At Houseboat, Check in time is 1200 noon and check out next day morning 9 am. In AC boats, AC is installed in bedroom and it will switch on from 9 pm to 6 am only. Please carry your favorite songs / movies so that you can play the same in car / houseboat. If you are visiting small cities or villages, dressing modestly is advisable and avoid revealing clothes. 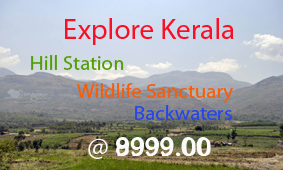 Online advance reservation facility available for Thekkady boating, If interested, please book tickets at http://www.periyarfoundation.online/ : afternoon 3.30 pm or morning 7.30 am trip is advisable.